Here is a blast from the past for you. SLAUGHTER LORD were an Australian thrash band circa 1986-1987 who never released an album but managed to leave their mark on the international scene courtesy of a well circulated demo and a reputation as a killer live act. This CD retrospective is their first "real album" and contains the "Taste of Blood" demo as well as some studio and rehearsal tapes all recorded back in the day. The quality of the recording is obviously pretty rough and, frankly, it sounds about like you would expect a 14 year old demo tape to sound. But if you have waited a nearly a decade and a half to get your hands on some product from SLAUGHTER LORD then that is hardly going to matter now is it? Their metal is heavily influenced by the likes of SLAYER, EXODUS (the first album) and CELTIC FROST as well as the German scene of the day ala DESTRUCTION, KREATOR, ASSASSIN and SODOM. There are even touches of BATHORY (the aggressive stuff not the weird stuff) here and there. If you remember the mid and late eighties thrash scene as I do (I started college in 1987) or have recently rediscovered it thanks to the retro movement, then this CD might pique your interest. For those not in the know, this is the scene that spawned death metal and ironically it was the popularity of death metal that killed this kind of music. 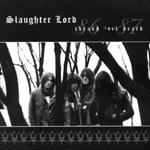 It must be said that SLAUGHTER LORD sounds as dated as indeed it is and the band, even in its day, wasn't as impressive as any of the bands mentioned above (except for BATHORY who sucked) but, hey, it's not like you are going to find anything else like this released in 2000.